Gov. Andrew Cuomo issued an order to help New Yorkers deal with homelessness as temperatures drop. But will it do anything? It was a cold winter afternoon under the MetroNorth tracks at 125th Street, where a group of homeless individuals congregate, panhandle and always get chased away. Yesterday, it was El Hadj Drame's turn. A tall man of erratic motions and sometimes confusing conversation, Drame can often be found at 125th, sometimes drinking surreptitiously from plastic bottles, guarding his shopping cart of belongings. It was the shopping cart that drew the attention of two police officers, who asked Drame to move the cart out of the flow of pedestrian traffic. Wearily, they went through the routine of trying to help: "Would you like some information or some assistance," they asked. "Would you like to go to the hospital?" "Sorry about it. I go, I go," he said. He moved off farther down the street, past an outreach team, also keeping an eye on the small group. The interaction epitomizes the difficulty of enforcing Cuomo's most recent broadside against Mayor Bill de Blasio in the homeless wars an executive order directing local social service agencies and police departments to move homeless people in need into shelters when the weather drops under 32 degrees. What happens if they won't go? The homeless presence on 125th Street has been much maligned, branded an "encampment" and a breeding ground for K2, or so-called synthetic marijuana, a PCP-like substance popular among the city's homeless. But regulars at the spot keep coming back, for the moneymaking possibilities — opening a cab door for train commuters could result in a tip — and the company. Shivering in a heavy jacket and vest, with a t-shirt wrapped around his head under a hood, Romeo Ken, 32, said he wasn't dumb enough to stay out in the cold to die, but maintained that some wouldn't want to be forced into shelters, particularly when it would put their safety or belongings at risk. "He's not gonna go in with a shopping cart," Ken noted, pointing at Drame. 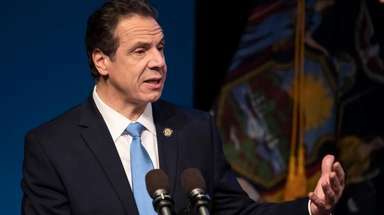 Cuomo has a long history working on homeless issues — first as an advocate and then as Bill Clinton's secretary of housing and urban development. When it was announced this week, the surprise order immediately resulted in questions, from homeless advocates wondering how "mandatory" the removal would be, and from the de Blasio administration which insisted that the executive order was already being carried out through increased outreach during freezing weather, insofar as the law allowed. A person who is found to be mentally ill and on the street, in danger, can be taken to safety, but a dragnet of involuntary confinement would most likely be illegal (not to mention impractical). The order also directs municipalities to extend shelter hours and ensure that shelters are safe, clean and well maintained — perhaps the more salient part of the issue: creating a place where homeless people won't be afraid to stay. Regrouping with the other 125th Street regulars after the NYPD moved them along, El Hadj Drame was still in possession of his cart. His brother, Ousmane Drame, watched him. "I think it will be a problem," he said of Cuomo's new executive order. "Maybe he means good. But he should've come up with something better." Outreach was good, he acknowledged — it'd be good at least to know where homeless people are. He asked El Hadj what he would do if someone tried to force him out of the cold. He laid his oversize gloves on the cart. "I don't go to shelter," he said. "Street is better than shelter."